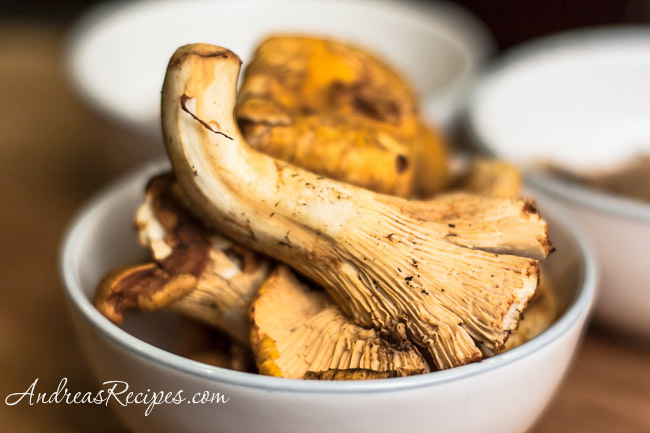 Around this time last year I received an email from Susan (Farmgirl Fare) telling me that I had won a box of fresh chanterelle mushrooms from Marx Foods in her giveaway. Once I recovered from the happy shock of winning two pounds of chanterelle mushroom I eagerly anticipated their arrival. When the box arrived at our door I was giddy with excitement. I don’t get giddy over too many things, but I was giddy over these chanterelles. Chanterelles only grow wild and are usually found in the forest in areas with deep leafy debris from July to frost. They are considered a delicacy and are prized by chefs for their flavor and texture. They are at their best when sautéed with butter and onions but also work well in soups and just about anything with white wine and cream. We had plenty of chanterelles to play with and play we did. First we prepared them in a simple sauté with butter, which tasted magical. Then we cooked them in Elise’s cream of wild mushroom soup, my favorite recipe for cream of mushroom soup, along with porcinis and morels and the combination was fantastic. With a rather large supply of chanterelles still left we decided to add them to our stuffed pizza. I had a fleeting moment of concern that the other flavors in the pizza might overwhelm the chanterelles, but I worried needlessly. Their flavor came through and the pizza was delicious. I lost track of these photos last year, some of the first I shot with the new camera Michael gave me, and I finally gave up on writing this post because I didn’t have anymore chanterelles to replicate the effort. 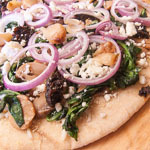 Then out of the blue I stumbled across the photos last week, almost one year to the day that Susan sent me the news on winning the chanterelles, and I knew I wanted to post this pizza recipe and finally publicly express my thanks to Susan and Marx Foods for the delicious gift. Prepare the dough and the sauce per the instructions in Chicago-Style Stuffed Pizza. ASSEMBLE: Preheat the oven to 450° F/230° C. Punch down the dough and turn it out onto a work surface. Knead for about 1 minute. 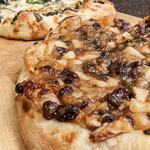 Divide the dough into two pieces, about 1/3 and 2/3 of the dough. Roll out the larger piece in a large circle until it is about 3 (7.6 cm) inches larger than the pan and 1/8 inch (3 mm) thick. Oil the bottom and sides of the pan. Place the dough into the pan and push it into the bottom and sides. The dough should overlap the pan by about 1 inch (2.5 cm). Trim the excess dough with a knife, and set the pan aside. Roll out the second piece until it is about the same size as the pan. Toss the cheese and spinach together in the medium mixing bowl, and then put it into the pizza pan. Sprinkle with the chanterelle mushrooms. Lay the second piece of dough on top, then crimp the two edges of the dough together with your fingers to form a thick border. 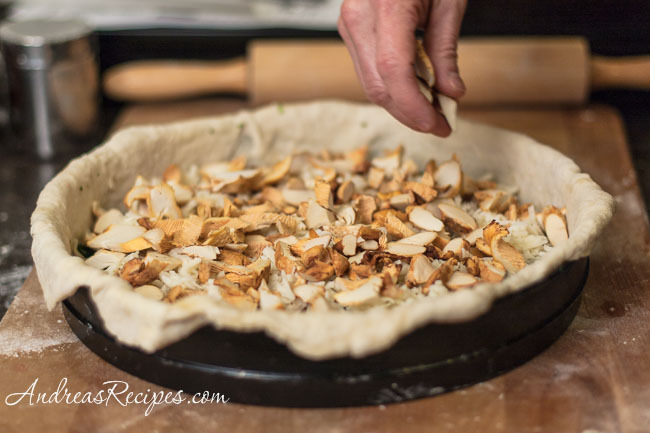 Press down on the filling with your hand, and cut a 1-inch (2.5 cm) slit in the center of the top crust to allow steam to escape. 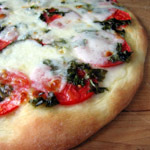 Spread the tomato sauce evenly over the top crust and sprinkle with more grated parmesan cheese. So I’m not usually a huge fan of Chicago pizzas, with their meat-sweat inducing abundance of protein, but I’m pretty sure I would like this one. Looks delicious! An original pizza! I bet it taste élovely! 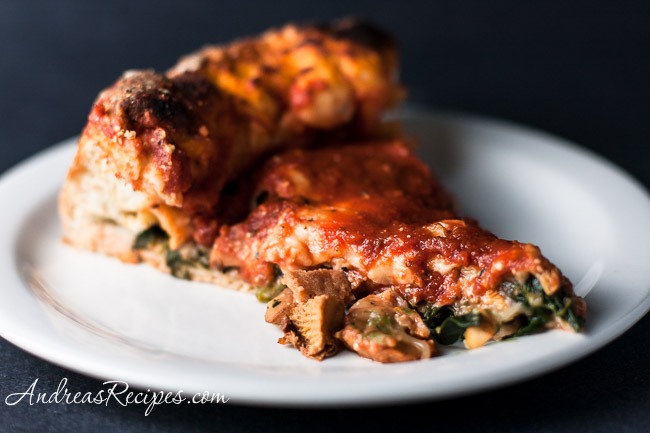 I have a weakness for stuffed pizza (ok, all pizza) and chanterelle mushrooms are so delicious. This pizza looks pretty fantastic. Your picture makes me instantaneously hungry.